so finally a version, that works somehow. the self-imposed task was to create a prepared workflow to create broken concrete surfaces by the use of procedural textures. first i painted a concrete texture, to have an initial point to recreate in procedurals. then i took the mesh and created the procedurals for that. i took many bercon noises and nested them. first place big noises, then getting smaller. 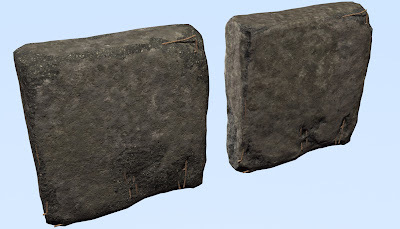 i made 2 materials, one with concrete and one with broken concrete. these two i put in a blend material, and used vertex colors to blend them. for this i used this Warp plugin, from footools, and this tutorial from neil blevins for getting cool fractal blendings out of simple straight vertex colors. #for setting the vertex colors very fast, i used neils script "cornerEdgeToVertexMap" from his infamous "soulburnscripts! this whole thing to (hardly) understand and getting working took me now nearly ~12 working days, when i take all the time in line.